The white flowering Astilbe ‘Professor Van der Wielen’ is a well known A. thunbergii hybrid. Excellent in dappled shade, this is a mound forming plant that will reach around 50cm in height, taller in good conditions. Over time will form a dense clump to around .75 metres across. The showy white flowers held on upright spikes are the main attraction in spring. They rise above the ferny foliage and hold well on the plant for weeks. 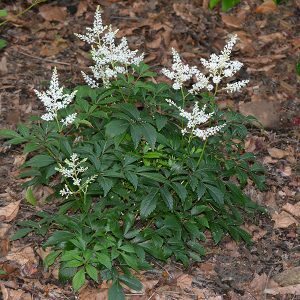 Grow Astilbe ‘Professor Van der Wielen’ is a shaded woodland position where the flowers are some brightness in spring and the foliage acts a ground cover through until autumn. It can also be used to underplant taller shrubs grown in containers. Excellent in a shady courtyard. Flowers are sometimes used as cut flowers along with a little foliage. In a humus rich soil that retains moisture through summer Astilbe ‘Professor Van der Wielen’ will thrive. In dry areas some extra water may be required in the warmer months. Mulch around the plant in spring to help provide a cool moist root run. We add a little well rotted cow manure and compost at this time. Over time the established clumps will need to be divided, generally very 4 – 5 years. 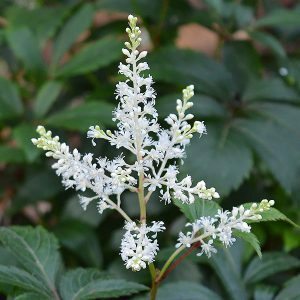 The best time to buy Astilbe ‘Professor Van der Wielen’ online is from autumn into winter while it is dormant. Astilbe ‘Professor Van der Wielen’ is available for sale from the following nurseries.